Q1. If a route reflector hears an update from a nonclient, what action will be taken? Answer: If a route reflector hears an update from a nonclient, it will reflect the update to clients only. Q2. In version 11.0 of the Cisco IOS, what method would be used to restrict routing information from being received or propagated? Answer: Distribute lists would be used to restrict BGP-4 routing updates in version 11.0 of the Cisco IOS. Prefix lists became available to ISPs in 11.2 of the IOS and in 12.0 to the general public. Q3. Explain the purpose and use of the command show ip prefix-list name [seq seq-number]. Answer: This command displays the entry prefix list with a given sequence number. Q4. How and why would you redistribute static routes into BGP-4? The static routes are forwarded to the nonexistent interface null 0 to aggregate the routes to create a supernet. This is then redistributed to the BGP process instead of the hundreds of routes that exist. Because any route redistributed into BGP-4 must be in the IP routing table, this is a way of creating a supernet and having it redistributed. A static route to null 0 is not needed if the network command is used and no address aggregation is performed. Q5. Give the command that would change the weight attribute for the path to the next hop 192.16.5.3. Q6. 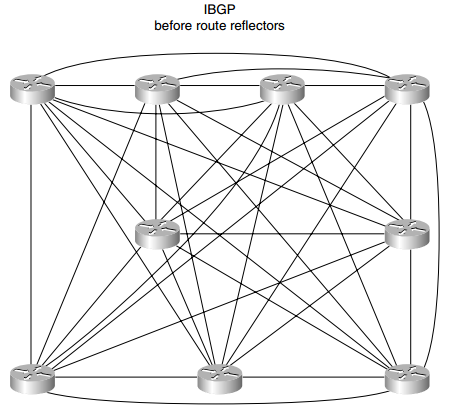 Why do route reflectors have to be fully meshed with IBGP-4? Answer: Although clients are not fully meshed within a cluster, it is important that the route reflectors are fully meshed. This is to ensure that the routers pass routing information to each other. Remember that IBGP-4 does not propagate routing information; it generates information only based on the network command. Q7. Why is filtering often required when redistributing BGP-4 into an IGP? Answer: Filtering is often required when redistributing BGP-4 into an IGP because the routing tables can become overwhelmed by the number of routes that are imported. Q8. What are the advantages of multihoming? Answer: Multihoming allows for redundancy, which is important when the link is into the Internet and may well carry crucial business information for the company. Multihoming also increases performance by allowing the selection of the better paths. Q9. What are the two most common forms of multihoming? The ISPs send default routes into the autonomous system. The default routes and some selected routes are sent by the ISP into the autonomous system. All routes known by the ISP are sent into the autonomous system. Q10. Which command will show the local preference and weight attribute values? Answer: The command that shows the local preference and weight attribute values is show ip bgp. Q11. Why does IBGP-4 need to be fully meshed? Answer: IBGP-4 needs to be fully meshed because IBGP-4 has a fundamental rule that states that IBGP-4 will not propagate back into IBGP-4 a route that it has learned from IBGP-4. The reasoning is that this is the only way to prevent routing loops. If each router is connected to every other router (fully meshed), the updates come directly from the source, which removes the need for a router to propagate any updates that it has received. Q12. How is a fully meshed network avoided in IBGP-4? Answer: A fully meshed network can cause some problems to the routers because they have a great deal of information to deal with from every directly connected router. To avoid this intensity of bandwidth, CPU, and memory, an alternative is the configuration of route reflectors. Route reflectors allow the router to pass routes on to its peers. Q13. What is the formula to determine the number of sessions needed in a fully meshed BGP-4 network? Answer: The equation for determining the number of sessions required is n (n – 1) / 2, where n is the number of routers. Thus, 10 routers would mean 10 (10 – 1) / 2 = 10 × 9 / 2 = 45 sessions. Q14. Why does a fully meshed network in IBGP-4 cause problems? Answer: A fully meshed network in IBGP-4 causes problems because the network has to accommodate a large number of TCP connections, and this can eat up memory, CPU, and eventually bandwidth. Q15. State two benefits to using route reflectors. The use of a router reflector means that fewer TCP peer connections are needed. This streamlines the network traffic and solves the excessive use of network resources sometimes incurred with a fully meshed network. The design and configuration are very straightforward, which means that it is easy to implement and thus to migrate an existing network, particularly because path attributes are not affected by them. Despite the fact that the route reflectors are straightforward, the flexibility in the design means that it is possible to become very sophisticated using redundant route reflectors and even multiple levels of route reflectors. Complex solutions are possible using router reflectors. Q16. Can the next-hop-self option be used between EBGP-4 peers? Answer: No, the next-hop-self option is used only with IBGP-4. It is used on a broadcast multiaccess link and ensures that the appropriate source address for the update is provided in the message header. In EBGP-4, this is not relevant because the next hop is always that of the EBGP-4 neighbor. Q17. Explain the difference between a cluster-ID and an originator-ID. Answer: The cluster-ID is an optional, nontransitive BGP-4 attribute (type code 10). A cluster is the route reflector and its clients. If a cluster has more than one route reflector, it needs to be identified by a cluster-id. This is listed in the update; if a router receives an update with its own cluster-ID, it will be ignored, thus preventing routing loops. An originator-ID is the ID given to a route reflector when there is only one route reflector in the cluster. It serves the same purpose as the cluster-ID in that it prevents routing loops because a router that receives an update that contains its own originator-id will ignore the update. Therefore, the difference between the two is one of scale. The originator-ID is used for one route reflector in a cluster, whereas the cluster-ID is used when there are multiple route reflectors in the cluster. Q18. State two advantages in using prefix lists over access lists. They have a better performance than access lists. They allow editing of the lists so that additional lines of code can be inserted anywhere in the list. The user interface is easier to use. Q19. If the ISP has provided a default route, how will the router within the autonomous system select the exit path in a multihomed environment? Answer: The IGP within the autonomous system will use the metric associated with that routing protocol. The router running EIGRP, for example, will select the nearest router based on the composite metric of bandwidth and delay (by default). Q20. What is a disadvantage of an autonomous system receiving full routing updates from all providers? Answer: The disadvantage is that a great deal of network resources, such as memory and CPU, is required. Q21. What is the danger of redistributing BGP-4 into the IGP? Answer: The danger is that the autonomous system routers receiving the BGP-4 updates will be overwhelmed by the amount of routing information that they receive. This could result in an unstable network or even a network exhausted unto death. Q22. What are the advantages of a fully meshed IBGP-4 network? Answer: The advantage of a fully meshed network is that the network will receive full routing information from the directly connected peers. This means that the IGP does not need to carry routing information to the BGP-4 peers, and this means that no redistribution is necessary. This does not run the risk of overloading the IGP. It also means that the network will converge more quickly and that synchronization can be turned off, which will also improve performance. Q23. In configuring a route reflector, how is the client configured? Q24. What command is used to display the route reflector clients? Answer: The show ip bgp neighbor command is used for this. Q25. What commands are used to display the BGP-4 router ID that identifies the router that is sending the updates and peering with its neighbor? Answer: The commands that display the BGP-4 router ID are show ip bgp neighbor or show ip bgp ip address. Q26. Which command is used to display the AS path? Answer: The command used to display the AS path is show ip bgp.